Back in 2011, Peach State Roofing completed one of its most successful projects to date. Rabun Business Park, owned by The Development Authority of Rabun County (DARC), is a 971,905 sq foot multi-tenant industrial building tucked away in the beautiful Rabun County, GA foothills. 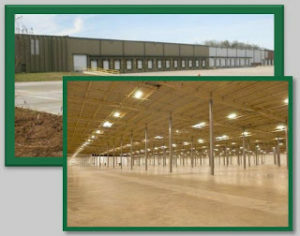 The newly renovated building can be home to manufacturing, distribution and/or call data centers. The DARC chose to add many energy efficient improvements to their building as well. The reflective white TPO was chosen in order to help save on the energy costs during the extremely hot summer temperatures. Fifty prismatic skylights were also installed to save on energy costs through natural lighting. In addition to the energy efficient improvements, DARC and PSR worked together in hiring local labor to help in the re-roofing process and create jobs in the North Georgia area. It was important to DARC to help boost their local economy and spark interest in their new venture. Peach State Roofing takes pride in providing a “valued” service at a great “value”. Aside from specializing in re-roofs and repairs, PSR also offers many other services including: new construction roofing, maintenance programs, energy efficiency evaluations, roof inspections, roof cleaning, etc.